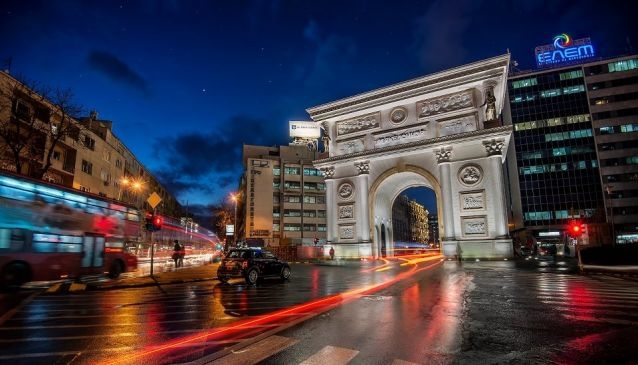 Macedonia Gate is a triumphal arch located on Pella square in the capital city-Skopje. This arch has reliefs carved in marbles, depicting scenes from the history of Macedonia which features images of historical figures including Alexander the Great. It is part of government-funded project 'Skopje 2014', its construction started in 2011 and was completed in January 2012. The arch is dedicated to 20 years of Macedonian independence and its outer surface is 193 m2. It is 21 meters high, there are rooms in its interior part, one of them functions as state-owned souvenir shop, as well as elevator and stairs that are providing public access to the roof. The rooftop allows for a great view of the city centre and the statue dedicated to one of the best warriors in world's history as well as a great view towards Vodno mountain and the boulevards that lead to the city centre.